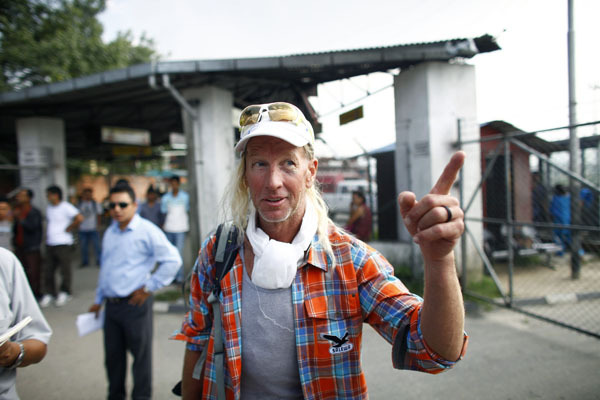 KATMANDU, Nepal – Renowned American extreme skier Glen Plake, one of the survivors of the weekend Himalayan avalanche that killed at least eight people, said Wednesday he feels lucky to be alive but heartbroken that he could not save two friends who remain missing. Plake is a champion hot-dog skier who has appeared in many extreme-skiing documentaries, including 1988’s “The Blizzard of AAHHH’s,” and also is well known for the tall mohawk he wears on the slopes. He had planned to ski down Mount Manalsu, the world’s eighth-highest mountain, after reaching the summit. Though he said he is “probably the luckiest person in the world,” he was unable to find his friends and climbing companions, Remy George Lecluse and Gregory Ugo Costa, both of France. Lecluse and Costa are among three people still missing from the avalanche, which swept the tents at camp 2 on Mount Manaslu at an elevation of 7,000 meters (22,960 feet) before dawn Sunday. Nepalese mountaineering officials say eight bodies have been recovered: Fabrice Priez, Philippe Lucien Bos, Catherine Marie Andree Richard and Ludovic Paul Nicolas Challeat of France; German Christian Mittermeyer; Italian Alberto Magliano; Spaniard Marti Roirg Gasull; and Nepali Dawa Dorji. Many of the survivors have returned to Katmandu, Nepal’s capital, and have abandoned their plans to climb the mountain this season. Sunday’s avalanche came at the start of Nepal’s autumn climbing season, when the end of the monsoon rains makes weather in the high Himalayas unpredictable. Spring is a more popular mountaineering season, when hundreds of climbers crowd the peaks. Mount Manaslu, which is 8,156 meters (26,760 feet) high, has attracted more climbers recently because it is considered one of the easier peaks to climb among the world’s tallest mountains. Avalanches are not very frequent there, but in 1972 one struck a team of climbers and killed six Koreans and 10 Nepali guides.